Shooting woes continued for Notre Dame. After losing to No.3 Virginia handily on Saturday, Mike Brey expressed that a quick start offensively would be crucial against No.2 Duke on Monday. Unfortunately, Notre Dame started the game 1-8 from the field and found themselves down 17-2 early against a talented Blue Devils team. Notre Dame’s young squad was outmatched from start to finish and was defeated by Duke 83-61. “They are really gifted,” said Notre Dame head coach Mike Brey. “We’re disappointed we lost. I thought we competed and battled. We needed to because we weren’t happy with that on Saturday. I told them we had the two best teams in the country roll through the building and I liked how we competed against this one tonight. Notre Dame dropped to 11-10 on the year and an ACC worst 1-7 in ACC play. Duke improved to 18-2 and 7-1 in the ACC. Entering the second half, down 18 points, Notre Dame had a hill to climb. 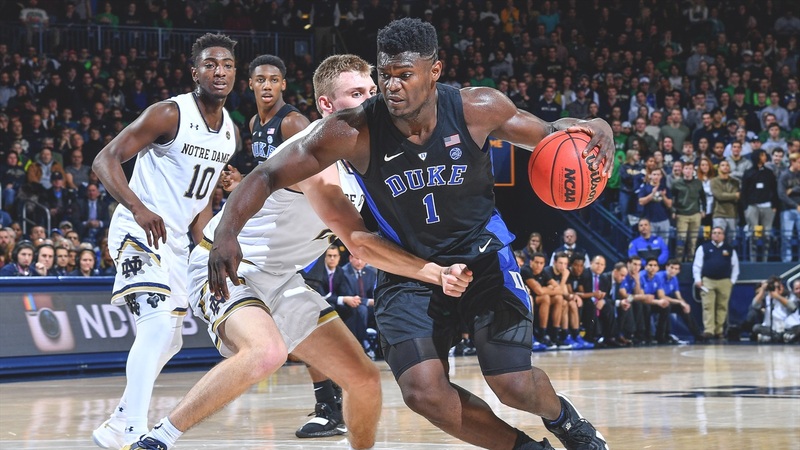 It started promising for the Irish however when Nikola Djogo hit a corner three-pointer to counter a pair of free throws by Zion Williamson, but all Notre Dame could do was match buckets with Duke for the whole second half and the talented Blue Devils deemed too much for the Irish. Duke held a double-digit lead the whole second half led by their big-three RJ Barrett, Cam Reddish and Williamson. Despite dropping their fifth straight game, a bright spot for the Irish was once again John Mooney. Mooney led Notre Dame with 14 points and also added 11 rebounds for his seventh straight double-double and 13th overall on the season. Mooney has been one consistent piece of the Notre Dame team this season. Prentiss Hubb also added 13 points for the Irish in the loss. “We stuck our nose in there and were physical,” explained Brey. “We have great kids. They knew they didn’t do that enough on Saturday. I love how they responded. We said we were going to give up threes because the numbers said to let them shoot jump shots. They came out stroking the thing pretty good. Williamson and Barrett led the way for Duke in the scoring column. They scored 26 and 17 points respectively. Williamson also showed off his complete game. The star freshman also added nine rebounds, four assists and four blocks. Notre Dame finished the night shooting just 35 percent from the field (23-66) and 33 percent from the three-point line (8-24). Duke shot 54 percent from the field (32-59) and hit 10 of their 19 three-point attempts. This is rare for the Blue Devils since they came into the game shooting the three ball very poorly. “We haven’t been able to score early,” said Brey. “That’s a deep hole. The two teams we’ve played against we excellent defensively. Duke’s pressure and switching was almost impossible to make a pass. You have to ball screen and someone has to drive and kick. We got to the offensive boards a little bit. To begin the game, Duke got off to a quick start with back to back three-pointers by Jones and Reddish. 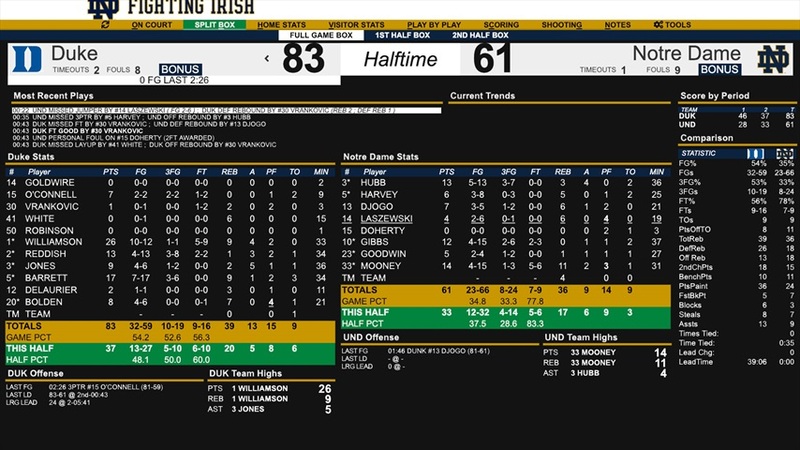 Dane Goodwin got the Irish on the board with 18:04 left in the first half with an offensive rebound and an easy layup, but this was the only offense Notre Dame got until Gibbs hit a three-pointer almost four minutes later. Duke started the game on a 20-5 run, on the shoulder of nine points from their star Williamson. 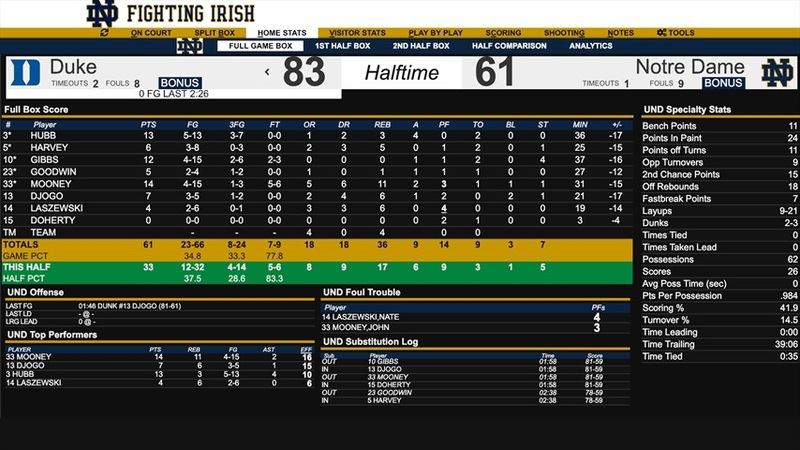 However, Notre Dame started to fight back with 9:54 left in the half when DJ Harvey got a putback to go after two offensive rebounds by the Irish. This sparked a 16-6 by Notre Dame to cut the lead to single digits. Hubb hit two three-pointers during the run and Nate Laszewski tallied a back-to-back layups to lead the Irish scoring attack. The Irish momentum didn’t last long. After the Irish cut the lead to nine, 32-23 with 4:50 after a Gibbs layup, Williamson hit a three-pointer from the top of the key and sparked a 14-5 run to end the half. Notre Dame went into the locker room down 46-28. Hubb led the way for the Irish with eight points including two from long range. Mooney wasn’t his efficient self offensively but tallied five points and six rebounds. Williamson and Barrett led the way for Duke. The freshman duo combined for 27 first half points. Williamson led the way with 17 points on 7-for-9 shooting and Barrett added 10. Notre Dame finished the half shooting just 32 percent from the field while Duke shot, 59 percent (19-32). The Blue Devils also shot an uncharacteristic 56 percent from three-point range to the Irish’s 40 percent.